If you'd like to keep any information you've typed into a Pages, Numbers, or Keynote document safe—well, safer, anyway—you can password-protect your files. It's easy to do, and the setting's in exactly the same place in all three iWork programs. To add a password to a document, open the file in question, click on the Inspector button on the toolbar, and then choose the Document Inspector tab (it's the first one on the left). Down at the bottom of that Inspector window will be a checkbox for requiring a password, along with a box for changing an existing one if you need to. When you check that, you'll be taken to a dialog box that'll let you set your password and enter an optional hint for it. And of course, trying to open the document afterward will bring up an "Enter Password" box. If you want to be extra safe, make sure you leave "Remember this password in my keychain" unchecked. With that off, you'll need to enter the password every time you open that file, which is what you're probably looking for, right? 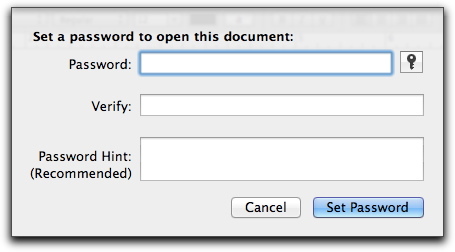 Here are a few important caveats on password-protecting your iWork files. First, if you want to be really, really secure instead of just kinda secure, you should be using an encrypted disk image to keep your stuff in instead. 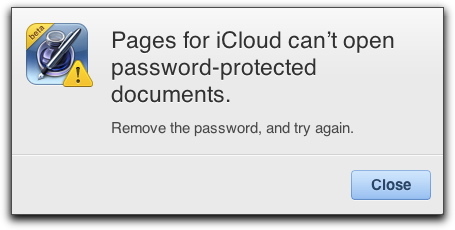 Also, if you're syncing documents with iCloud, note that passwords don't play particularly well with that; the iWork for iCloud beta, for example, doesn't support passwords on documents at all. And if you open a password-protected file on an iOS device, you'll see a warning that it'll strip the password out entirely! So tread carefully if you're using iCloud for document syncing, my friends, but otherwise, no one will ever see that spreadsheet you want kept private. Yes, that one. You know what I'm talking about.